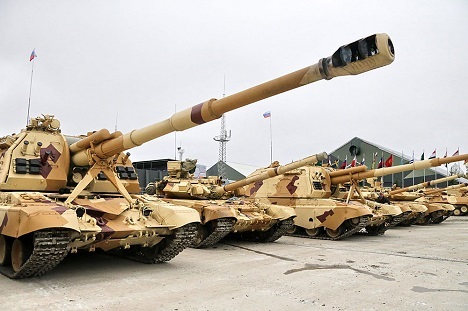 Russia exported armaments and military hardware worth more than $15 billion in 2014 and has signed new contracts to the sum of almost $14 billion. Russia is ready to develop military and technical cooperation with new markets in Southeast Asia, Deputy Defense Minister Anatoly Antonov said at an Asia-Pacific security forum on Monday. "This effort will be facilitated by Russia’s expanding potential for the export of new armaments and the broader range of services for their after-sale maintenance and also the economic development rates and the desire of the region's countries to diversify the sources of military hardware supplies," the Russian deputy defense minister said. Moscow will host an international military and technical forum, Army-2015, in June. New contracts on the supply of armaments and military hardware may be signed on the forum’s sidelines, the deputy defense minister said. Russia counts on the active participation of Southeast Asian countries in this important event, Antonov said. "Russia has quite large experience in military and technical cooperation with certain Southeast Asian states, such as Vietnam, Malaysia and Indonesia," the Russian deputy defense minister said. "This cooperation has good prospects, considering that Russian armaments are both well-known in the region and constitute the basis for the pool of military hardware in some states like Vietnam, Laos and Cambodia," he added. Russia’s military products over this period were in demand in more than 60 states. Russian President Vladimir Putin has said Russia is a reliable partner on the world armaments market and does not make the fulfillment of its obligations dependent on the political situation. Putin said at the May session of the Russian Commission for Military and Technical Cooperation: "Our competitive advantages include the successful and years-long operation of domestic armaments in all climatic zones." The list of the world’s ten largest weaponry importers includes five Asian states, which account for 30% of global armaments imports, according to data of the Stockholm International Peace Research Institute.